A great advantage of X-ray analysis as a method of chemical structure analysis is its power to show some totally unexpected and surprising structure with, at the same time, complete certainty. In 'X-ray Analysis of Complicated Molecules', Nobel Lecture (11 Dec 1964). In Nobel Lectures: Chemistry 1942-1962 (1964), 83. 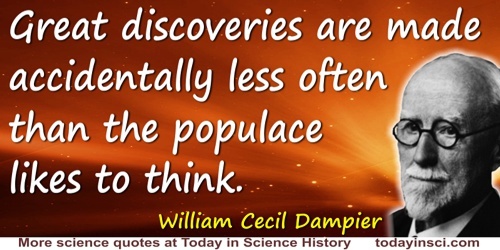 Great discoveries are made accidentally less often than the populace likes to think. 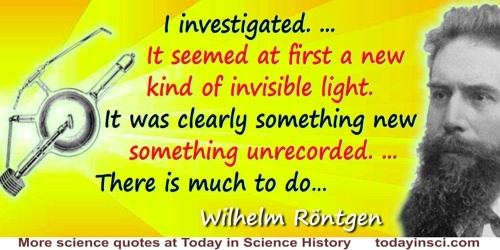 Referring to the accidental discovery of X-rays, in A History of Science and Its Relations with Philosophy and Religion (1931), 382. 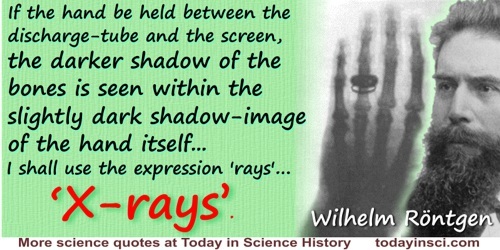 If the hand be held between the discharge-tube and the screen, the darker shadow of the bones is seen within the slightly dark shadow-image of the hand itself… For brevity’s sake I shall use the expression “rays”; and to distinguish them from others of this name I shall call them “X-rays”. From 'On a New Kind of Rays' (1895). In Herbert S. Klickstein, Wilhelm Conrad Rontgen: On a New Kind of Rays, A Bibliographic Study (1966), 4. In my own field, x-ray crystallography, we used to work out the structure of minerals by various dodges which we never bothered to write down, we just used them. Then Linus Pauling came along to the laboratory, saw what we were doing and wrote out what we now call Pauling's Rules. We had all been using Pauling's Rules for about three or four years before Pauling told us what the rules were. In The Extension of Man (1972), 116. Sodium thymonucleate fibres give two distinct types of X-ray diagram … [structures A and B]. The X-ray diagram of structure B (see photograph) shows in striking manner the features characteristic of helical structures, first worked out in this laboratory by Stokes (unpublished) and by Crick, Cochran and Vand2. Stokes and Wilkins were the first to propose such structures for nucleic acid as a result of direct studies of nucleic acid fibres, although a helical structure had been previously suggested by Furberg (thesis, London, 1949) on the basis of X-ray studies of nucleosides and nucleotides. 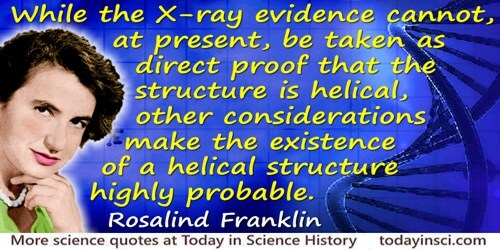 While the X-ray evidence cannot, at present, be taken as direct proof that the structure is helical, other considerations discussed below make the existence of a helical structure highly probable. From Rosalind Franklin and R. G. Gosling,'Molecular Configuration in Sodium Thymonucleate', Nature (25 Apr 1953), 171, No. 4356, 740. (1965). In Isaac Asimov’s Book of Science and Nature Quotations (1988), 233. In National Academy of Sciences, Biographical Memoirs, Vol. 53, 141. We have now got what seems to be definite proof that an X ray which spreads out in a spherical form from a source as a wave through the aether can when it meets an atom collect up all its energy from all round and concentrate it on the atom. It is as if when a circular wave on water met an obstacle, the wave were all suddenly to travel round the circle and disappear all round and concentrate its energy on attacking the obstacle. Mechanically of course this is absurd, but mechanics have in this direction been for some time a broken reed. Letter to Margery Moseley (2 Feb 1913). In J. L. Heilbron (ed. ), H. G. J. Moseley: The Life and Letters of an English Physicist 1887-1915 (1974), 201. When you no longer know what headache, heartache, or stomachache means without cistern punctures, electrocardiograms and six x-ray plates, you are slipping. Quoted in 'Edison Fears Hidden Perils of the X-Rays', New York World (3 Aug 1903), 1. X-rays. Their moral is this—that a right way of looking at things will see through almost anything. Samuel Butler, edited by Geoffrey Keynes and Brian Hill, Samuel Butler’s Notebooks (1951), 282. [Our work on the structure of DNA] was fairly fast, but you know, we were lucky. One must remember, it was based on the X-ray work done here in London started off by Morris Wilkins and carried on by Rosalind Franklin, and we wouldn’t have got to the stage of at least having a molecular model, if it hadn't been for their work. Quoted and cited from BBC radio (1999) in transcript of Australian ABC radio program PM (30 Jul 2004) on the ABC website.